At more than a few points along your RV journey, you’ll need to stop for fuel, both for yourself and the vehicle. In your hometown, you probably know the locations for gas and snacks and can get in and out really quickly. On the road, it’s not so easy. Especially if you’re in an RV. Parking, fuel choice, and safety are all primary concerns when traveling in unfamiliar territory. Here’s a list of some tip and tricks to keep you on the road and prevent some disasters from happening when you stop for fuel on your RV vacations. 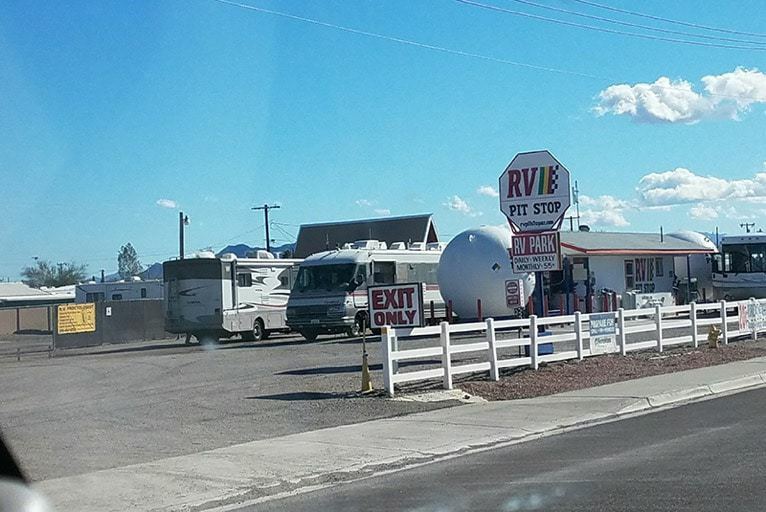 There’s a certain criterion you should look for when you chose a place to stop for fuel or restrooms while in an RV. There needs to be the type of fuel your vehicle needs. It needs to be easy to get into and out of, for an RV sized vehicle. Finally, it needs to be safe and clean. 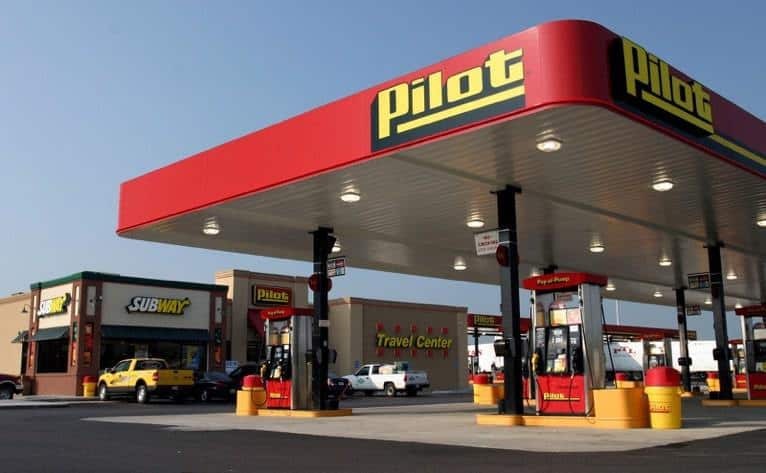 For these reasons, we’re going to recommend stations designed and marketed for big rigs like Pilot, Flying J, or Loves. Here’s why: they’re trying to attract truckers, people who travel for a living and they do a very good job of providing a consistent level of service everywhere you go in the USA. When a trucker, or a certain RV driver, stop for fuel, they’re buying much more fuel and usually diesel at that. Here’s much more money for these companies to make catering to commercial traffic and they often have much better food, cleaner restrooms, security, and fairer prices than typical gas stations. 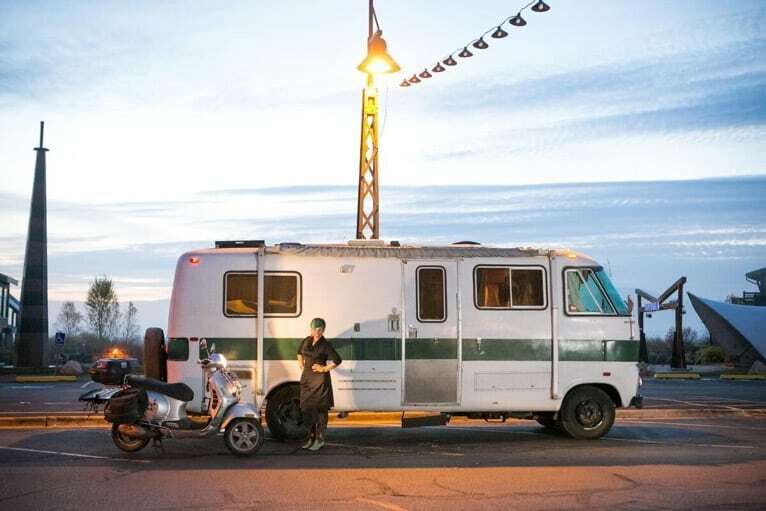 Don’t wait until your gas light is on to get fuel while in an RV. 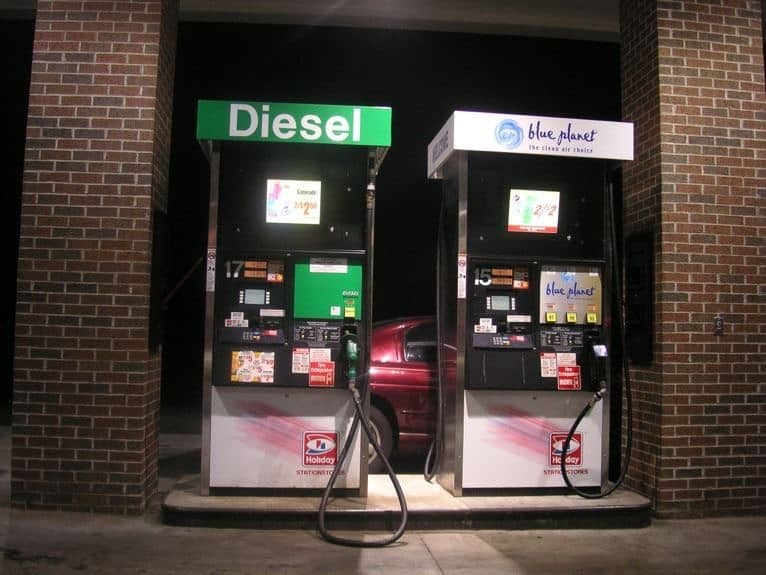 In large vehicles, the fuel moving through the vehicles fuel pump lubricates it and if you miss a gas station and your pump runs completely dry, you may need an expensive tow and even more expensive trip to the mechanics! Getting into and out of large fuel stops designed for truckers is easy enough. These areas are well lit and well-marked. However, typical gas stations and rest areas are another stories. While you may not be comfortable driving or parking amongst 18 wheelers you may be required by the state you’re traveling through depending on the size and gross weight of your RV. 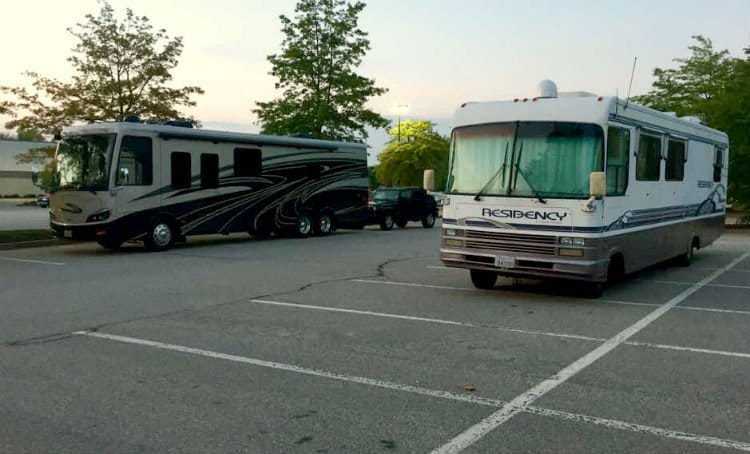 You may find your RV will not physically fit into typical parking spots, ruling out many typical rest area locations. Plan ahead to know these things. The last thing you want is to get stuck in an area you can get out of, or a huge ticket because you didn’t plan your way out of a parking lot! There are two things to look out for when thinking of safety when stopping for fuel or facilities, personal security, and vehicle security. Don’t leave yourself open to hazards like leaving the pump running while you’re inside or leaving your vehicle unlocked. If you go to a franchise known for high traffic and good services like Pilot or Love’s, you’re very unlikely to have a problem. However, venture outside these well known reputable places and you may run into problems. Take a moment to google the high crime areas around the city you’re traveling through. These areas are most likely along major interstates that you may be traveling on and your nice RV may be an easy target for a busted window and stolen purse operation. Other problems like having your credit card information stolen, or being overcharged once you swipe are not uncommon. When in doubt, pay in cash and always get a receipt. Travel in pairs, and NEVER allow small children to roam around even seemingly mundane areas. Drivers can’t see children as well in their mirrors or over the hood of their truck and you never know who is at the gas station and what they may do to an unattended child. If you feel uncomfortable, most rest stops offer security that can walk you to your vehicle, plan around using these facilities if need be. The idea behind traveling is to eventually get somewhere. That means if you’re sending tie at a truck stop, you’re doing it wrong! There’s no need to be in an insane time crunch while traveling on vacation but for a whole host of reasons you’re going to want to get In and out of a fuel stop as quickly as possible. It’s very easy to kill a half hour, or more while getting fuel and using the restroom at a gas station. Try and save precious daylight when you’re traveling in an RV. When traveling on an RV you have work to do when you get to the campground or RV park. You’ll have to check in, unpack your hook up equipment and hook up your RV for water and power. None of that is very fun in the dark! If you go to the right kinds of places, you’ll get a decent price for fuel. To be clear, a penny’s worth of difference when it comes to a single fill-up isn’t as big a deal as getting quality fuel in a good location. Quality fuel has nothing to do with an octane rating but buying from a well-kept facility or newer building means you’re more likely to get fuel that has been properly stored in certified equipment. If you have a large tank and will be stopping often look at websites like this, that automatically calculates the cheapest places to fill up along a route and suggested stops according to your vehicle. Otherwise, look for a fair fuel price but prioritize a safe area, with easy access and good service over the absolute cheapest price on gas. Simply put, if you feel like a price is unreasonable, or maybe misrepresented don’t pay it. Many truck stops are very fair in their pricing and you’ll have no issues but when it comes to specialty goods like first aid supplies or OTC medication it can be a hassle. Plan ahead to avoid these obstacles. Pay attention when an attendant is ringing up your items and always get your receipt. For example, if you wanted $50 in gas, but the clerk accidentally rang you up for $500 and your credit card processed it, you just bought gas for the next few people behind you! When it comes to making sure you have a good RV trip, the locations, and procedures for getting gas aren’t normally at the top of your list. However, along with knowing how to drive or tow RV proper precautions for stopping for fuel & gas is important. Enjoy your time with family and friends in your RV and do everything you can to make sure your pit stops go to make your entire trip more enjoyable. What’s your favorite place to stop on the road?